We stayed at d’Nusa Beach Club & Resort while we were on Nusa Lembongan and the helpful staff organised our booking with Scoot Fast Cruises. It cost is IDR2,000,000 (approx AUD$200) in total for two people and our route (Bali – Nusa Lembongan – Gili Trawangan – Bali) included transfers at every port except Gili T. After looking at Scoot’s website I think we were under charged. The published rates are IDR400k from Sanur to Lembongan, IDR750k from Lembongan – Gili and IDR750k from Gili to Sanur meaning it should have been IDR1,900,000 per person. I can only assume that d’Nusa have an arrangement with them which provides a discount to their guests so make sure you check with your hotel and see if they have a similar deal. The first leg of our journey was from Sanur to Nusa Lembongan. 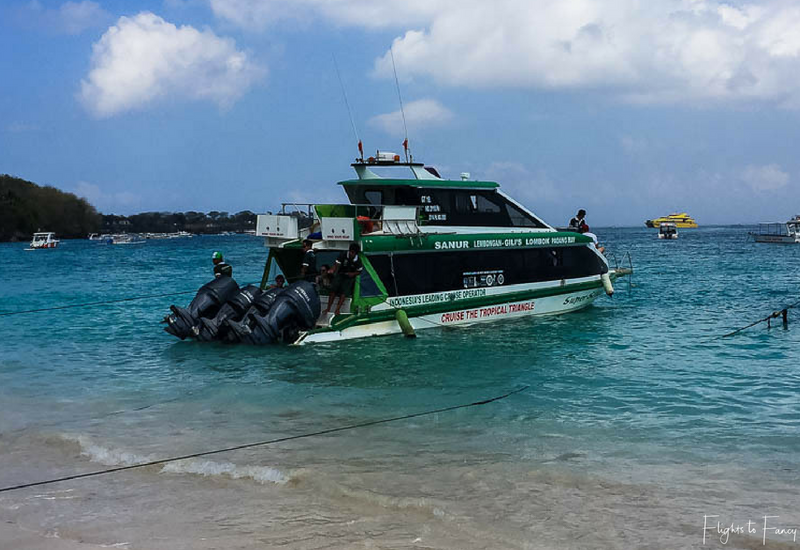 Our Jetstar International flight arrived in Bali late at night and our fast boat to Lembongan departed at 11.45am (other times are available at 9.30am, 1.30pm and 5.15pm). Given we had less that 10 hours in our accommodation and most of that time would be sleeping we chose budget overnight accommodation at Blanjong Home Stay in Sanur. It was just AUD$25 for the night. I always say there is a time to spurge and a time to save. By saving my pennies where appropriate I can spurge on luxury experiences more often. Our driver arrived right on time for the short trip to Sanur Beach. We hadn’t paid for our ticket so we had to make a quick stop at the office to fix it up. There is a 3% surcharge for credit card payments and my favourite American Express card wasn’t accepted. Luckily I have a backup Visa card for situations exactly like this. Once at the beach, we checked in at the Scoot kiosk and joined the throng in the small waiting area. It was chaotic with multiple boats departing at the same time to different destinations and no one really seemed sure where they should be. There is no pier at Sanur beach and you have to walk through the water to the boat. The staff take care of your large luggage and carry it overhead to keep it high and dry but you will be responsible for your smaller bags. Boarding is not first come first served, they call you by name and we were the last to board. Somehow I managed to get on board without getting completely soaked. Our boat was full and we took the only two seats available in the second last row. The seating configuration was booths of four with a narrow table in between the bench seats. If we were able to choose our seats I would have preferred to sit opposite The Hubs rather than next to him as I ended up awkwardly knocking knees with the complete stranger opposite me for the whole trip. We were about half an hour late departing and 10 minutes into our journey the couple opposite us no doubt regretted choosing the back row as they were drenched from the spray coming off the four high-powered engines. We copped enough of it to make it unpleasant but they were positively dripping. Just over half and hour later our fast boat to Lembongan reached its destination. I didn’t fare so well on the beach exit and took a waist deep dunking. My denim shorts were submerged and I just about managed to keep my bag with my laptop in it dry by heaving it over head. Now I know why some people on our boat from Sanur to Nusa Lembongan were wearing swimmers. It obviously wasn’t their first rodeo. After disembarking, we followed the narrow path about 100m or so to our transfer. 8 of us and our luggage piled into the back of the open air ute. Let’s just say it was very cosy and I was thankful it was a short trip. We were scheduled to be picked up at 9.45am for our 10.45am fast boat to Gili Trawangan but they were ready and waiting when we entered the lobby at 9.30am to check out. I’m not entirely sure why they collected us so early given it was only a 5 minute trip to the beach. Check in was simpler than it was in Sanur. We simply had to write our name and nationality on the ship’s log, get a sticker, tag our bag and wait. And wait. And wait. We waited an hour and a half in total. Some passengers chose to forgo the free transfer and make their own way to the office minutes before the scheduled departure. No doubt it wasn’t their first rodeo. There were three Scoot Fast Cruises boats lined up on the small stretch of sand and a fourth arrived just after the first left. We were half an hour late departing as we had to wait for some passengers who transferred from the last boat to arrive. We got one of Scoot’s bigger boats this time with five outboards to power us on our way. 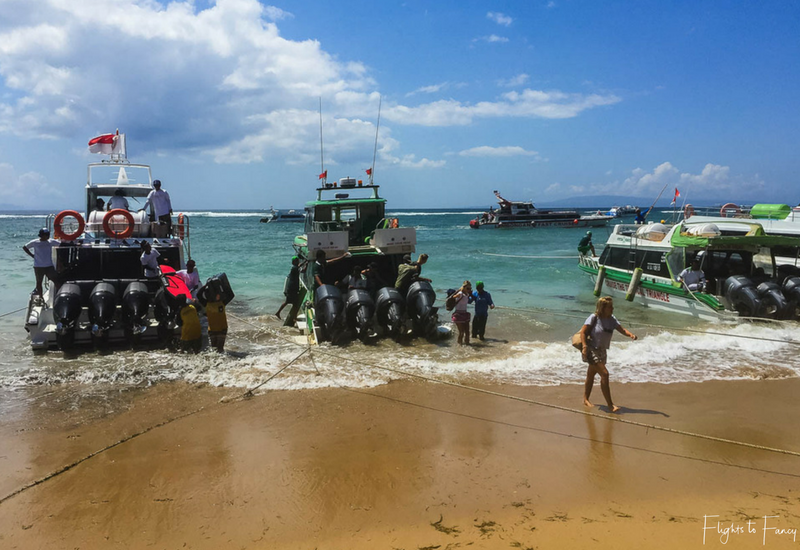 There were already passengers on board who were taking the fast boat Bali to Gili Islands direct without a stop in Lembongan. 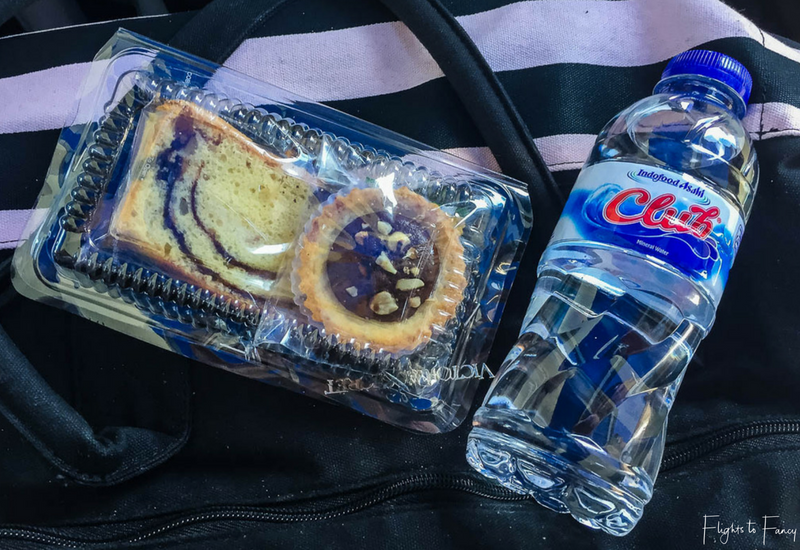 Shortly after boarding we were presented with a snack and water which was highly unexpected but much appropriated. The Hubs took a seasickness tablet for this longer trip just in case. There was music playing on board but it was barely audible over the outboards and the sound of the waves. The fast boat to Gili Trawangan covers all three of the Gili Islands and our first stop was at Gili Air. Gili Air is blessed with a pier so the passengers departing here didn’t have to negotiate a beach exit. 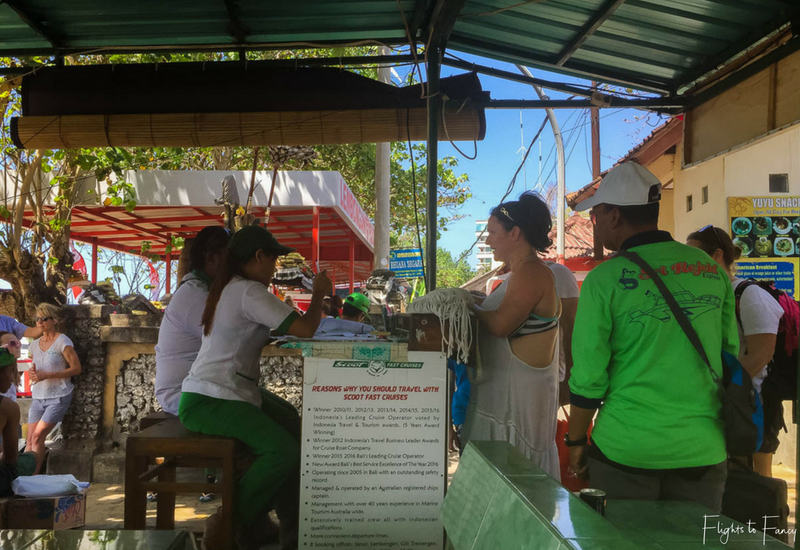 Passengers who booked the fast boat to Gili Meno also alighted at Gili Air and were transferred to another Scoot Fast Cruises boat. 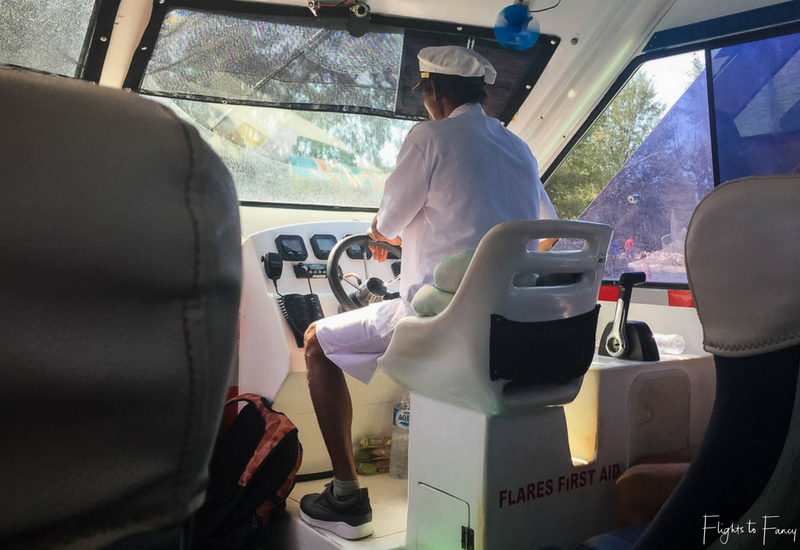 When we arrived in Gili Trawangan the boat parked nose end into the beach so disembarking involved exiting the cabin from the rear and tiptoeing around a narrow ledge to the front and climbing down the central ladder to shore. At least I stayed dry! Gili Trawangan does not have any cars so Scoot did not include transfers for this leg of our journey. It really wasn’t an issue as our accommodation at Villa Nero Gili Trawangan was only a 10 minute walk away. 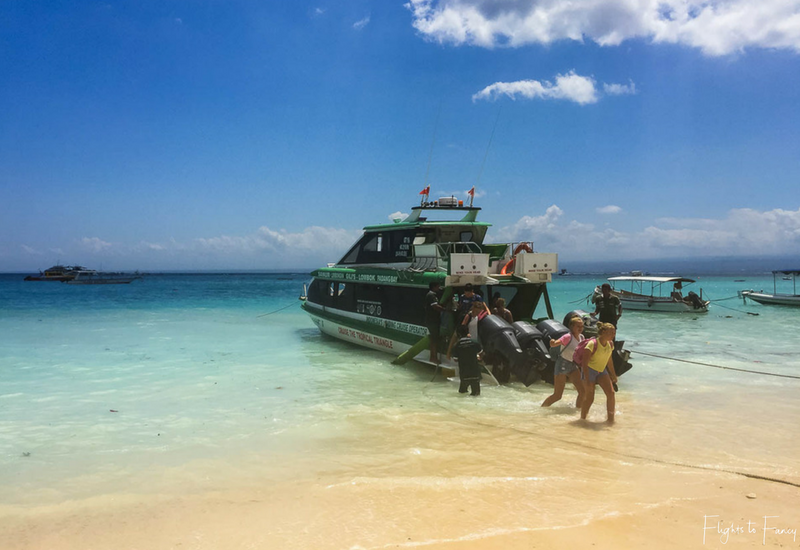 We were told by Scoot Fast Cruises in Lembongan to reconfirm the last leg of our journey with the Gili T office the day before our departure. We forgot and rang in a panic on the morning of. The Gili T office didn’t seem concerned and asked as to arrive at ‘the terminal’ (which is just a certain point on the beach) at 1pm for a 1.45pm departure. Given our experience of Scoot never departing on time we arrived as late as we thought we could get away with; 1.30pm. There was very little room at the office and we squatted on the wall of the nearby convenience store and waited. And waited. When it was finally time to board, the same rules apply for embarking from Gili T as disembarking. Up the ladder, walk around the boat (don’t fall in!) and enter from the rear. The crew on this leg were more boat proud and were obsessed with washing every grain of sand off the boat before we could board. And then we all had to dip our feet in a communal bucket on boarding. I dread to think of the amount of feet that went though it before mine and what sort of fungal diseases they may have had. Despite boarding almost last, we got one of the coveted rows of two seaters at the front rather than a row of three. Winning! Once we were all loaded and ready to go the crew realised two people were on the wrong boat. Not only the wrong boat but the wrong damn company as well! Who does that? Of course they had luggage in the hold which seemed to take forever to locate. We left almost an hour late which didn’t go down so well with the rest of us on board. About 15 minutes later we stopped at a big concrete pier on what I assumed was Lombok. I have no idea why. No one got on or off and the crew were not big on communicating with the passengers. A little over 10 minutes later we were on our way again. The cooling sea breeze coming though the open window was delicious in the stifling cabin until I copped a face full of salt water from an errant wave. The window stayed firmly shut after that. The other side of the boat didn’t seem to share my aversion to a salty shower and I still felt the odd bit of spray from their still wide open windows. The hull of the boat felt paper thin as we bounced across the swell and I could feel every bump under my bare feet. We were half way to Bali when things took a turn for the worse. Huge waves (in comparison to our tiny boat) crashed into us relentlessly on all sides. 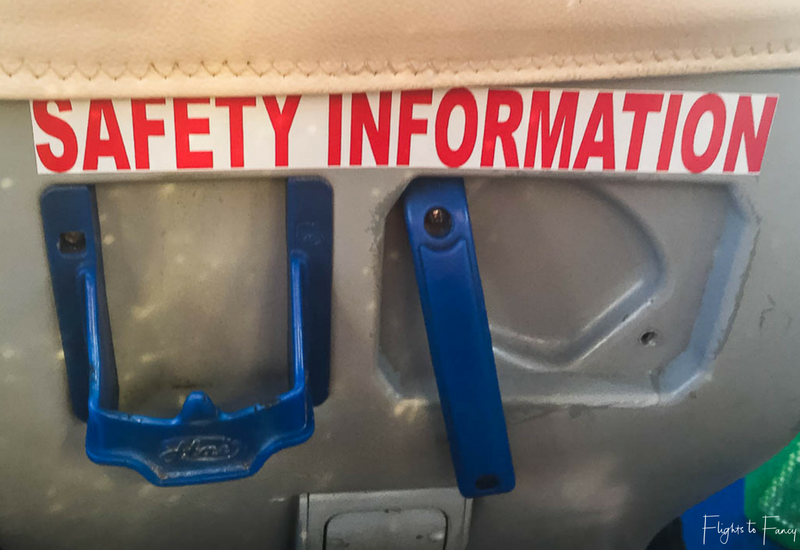 I tried to steady myself in my seat but the handle was broken and offered little assistance. The waves crashing over the bow and onto the roof made it feel like we were completely under water as the woefully inadequate windscreen wipers struggled to clear the captain’s view. It was akin to being in a washing machine. I seriously though we were going to capsize. I checked my phone to see if I had reception in the middle of nowhere so that I could say a final goodbye to my kids. I didn’t. I genuinely thought I was not getting off the boat alive. The captain seemed to be in an almighty hurry and refused to back off the throttle and actually steer the boat through the waves. He simply pointed dead ahead which made the ride even more perilous. We were launched into the air and came crashing back with a thud time after time as the sea churned all around us. The shrieks from the cabin let me know I wasn’t the only one concerned for our safety. People were screaming, children were crying and panic had well and truly set in. I had one hand on the back of the seat and one foot in the aisle, all the better to make a hasty exit if we needed to. There was no safety demonstration on boarding and while each seat back proudly proclaimed ‘safety information’ they were all empty. I had no idea where the emergency exits were but I planned how I would exit through the rear which was about as far away from us as possible given we were in row 3. It was around this time that the passengers starting succumbing to sea sickness. Unfortunately the netting on the seat backs that contained black plastics bags that I assumed were to be used on occasions like this were missing from many seats. Those with the coveted spew bags passed them to passengers more in need. As the cabin filled with the faint and unwelcome scent of vomit, the captain plowed ahead hell bent on not slowing down until the passengers started to scream at him. Never one to bite my tongue, I shouted instructions at him to steer into the waves rather than allow them to continually hit us side on with their brutal strength. He finally capitulated, slowed down slightly and started to steer the boat in a manner more suited to the conditions, but it was clear he had no idea what he was doing. Or simply didn’t care. The boat leaked like a sieve and sheets of water came through the window seals which sloshed around the cabin beneath our feet. The Hubs was closest to the window and while we didn’t have any safety information in the seat back in front of us, we did have a laminated card advertising accommodation in the islands. The Hubs tried to use it as a shield from the oncoming water but it was largely ineffective and he was soaked to the skin within minutes. I’ve been on many, many boats in my time and I am not being melodramatic when I say I have never been more scared in my life. 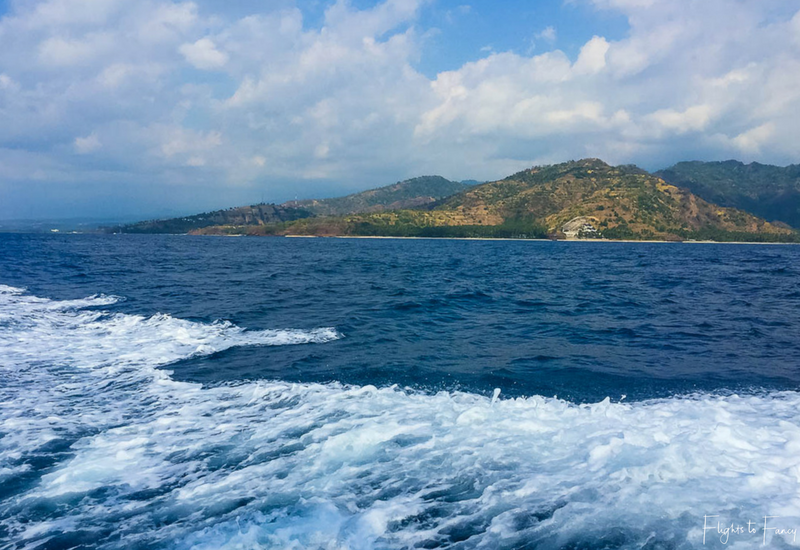 After what seemed like the longest 15 minutes of my life, the seas calmed somewhat as we neared the coast of Bali but we were still a long way from Sanur. The time couldn’t go quick enough and I would rather have been anywhere else on the planet than on that boat. As it was already past 5pm, I despaired that we would reach our destination in daylight and I did not want to be out there at night. An hour or so later Sanur was in sight. The captain had trouble ‘docking’ in Sanur. He had three tries at it and even then managed to bump the boat next to us. At that point I was just glad to be safe. Half the boat clapped when we finally reached land but he was getting no applause from me. The captain didn’t acknowledge the gesture. Instead he climbed through the front window, jumped into the water and walked off never to be seen again. Effectively he abandoned ship and left the crew to deal with the horde of angry, frazzled and sick passengers gathered on the beach. They did their best to calm the crowd as they carried every single piece of luggage overhead through the water. It was an arduous process. Once we had our luggage, we found our driver quickly and we were on the road to the Anumana Ubud Hotel by 6.30pm on the Scoot Fast Cruises free transfer. Meatloaf once sang that in relationships ‘two out of three ain’t bad’ but I can attest that does not apply to boat trips. While our first two trips were without incident, they in no way made up for the nightmare that was our last trip. 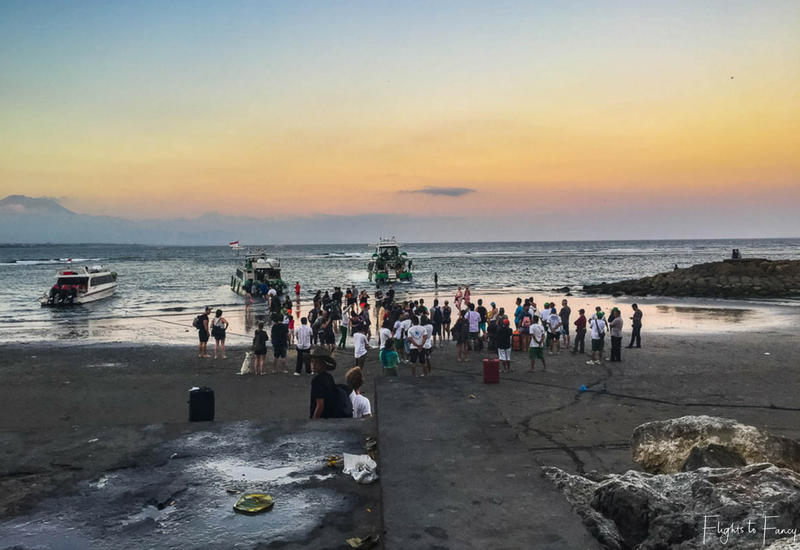 I was so shaken up by the experience, that when we finally arrived safely in Ubud I spent the night Googling Bali boat disasters and I was distressed with what I found. 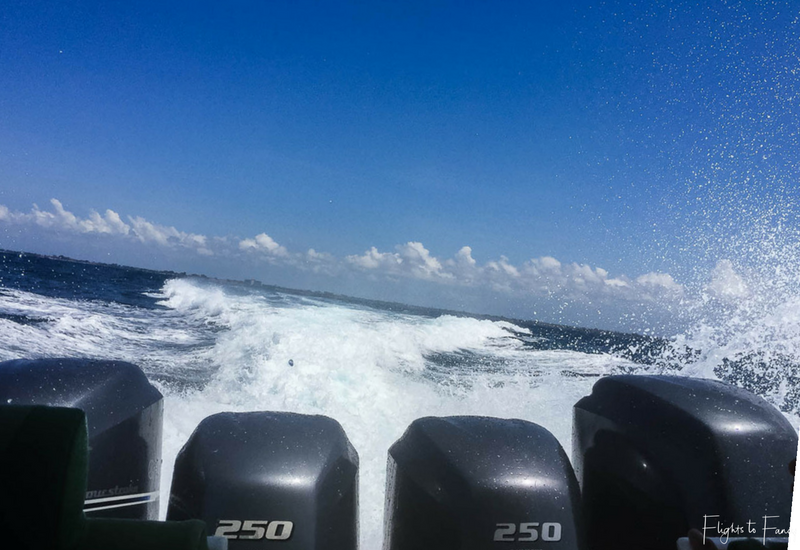 Turns out Bali boats don’t have the best safety record, but one thing that seemed constant was that many issues were caused by rough seas. Maybe we were just unlucky. Maybe it was particularly rough day. Maybe the captain was just a little too inexperienced. Maybe it was a combination of the three but I’m glad I lived to tell the tale. I do know that the next time I travel from Bali to Gili Islands I’ll be looking at flights to Lombok as an alternative to the fast boat Bali to Gili. 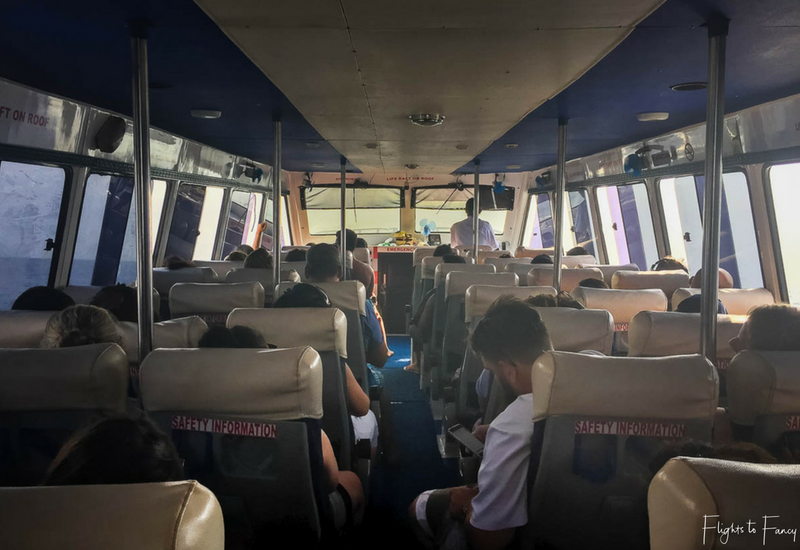 I would use Scoot Fast Cruises again to get to Nusa Lembongan but I would most certainly check the weather first and if it wasn’t ideal I would not board. 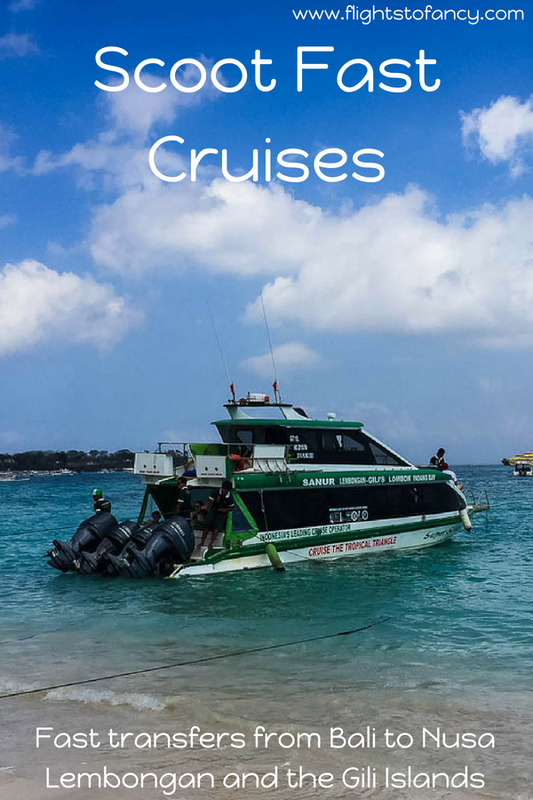 Have you travelled on a fast boat from Bali to Nusa Lembongan or the Gili Islands? I’d love to hear about your experience in the comments below. Disclosure Statement: This post is not sponsored. I paid for all my trips of Scoot Fast Cruises in full. The information in this article is based on my own personal experiences and has not been influenced in any way by the brand(s) featured. This post may contain affiliate links which if clicked may earn me a small commission on purchases at no extra cost to you. Wow. This was quite an experience. I can’t begin to imagine how you felt. When you mentioned calling your kids for the last time I felt that because I have kids too. Glad you made it out okay. Now i know to avoid it when i visit Bali. Patagonia sounds like a great alternative Marianne. My thoughts are with all those affected. Such a beautiful part of the world. My thoughts are with those currently affected in Lombok and the Gili Islands. Next time I will fly into Lombok it take the large ferry. That is such a great deal that you were able to get about $200 for the fast cruise! I’ve definitely seen those prices offered at a much higher rate, so that’s such a great deal! Too bad about your overall experience though. I’ve done a fast boat trip here in the Philippines in rough waters and I wasn’t too sold on it. But your experience sounds a lot worse! It was definitely something I don’t care to repeat in a hurry. I had no issues on the ‘fast’ boat from El Nido to Coron in the Philippines so I guess it all depends on the day. I was stressed reading this, so I can only imagine what a nightmare this was for you. I’m not much of a boat person, so I would be panicking well before you likely did. I can’t believe the captain just left the boat and had the crew deal with the mess afterward. Sounds like a very unprofessional company and one I won’t support if I’m in Bali (sounds like booking a flight is the way to go). This is one of my worst nightmares! I can’t remember the company we used when going to Gili, but the waves got pretty intense at one point. Nothing as bad as this though! I also took a dramamine and thank god I did! Glad to know everyone made it safely off the boat to Ubud! I have visited Bali before but not ventured out to the islands. This is good post to find out about these hidden gems. Not sure about the scoot tours though as they seem a bit cowboyish. Surely the easy and faster way to reach the islands but seems a bit of a push if with kids. The Bali yo gili island surely looks exciting but nit fir the fair hearted. Signing that log book seemed like signing your life away. But overall looks like you guys had s great trip. Gosh what an exciting trip! And not in a good way. That last leg sounds terrifying and the company overall sounds like real cowboys to be honest! Glad you were safe in the end! I’d really like to go to Gili T! But I’m prone to motion sickness so that last boat ride sounds like a nightmare! I can’t even imagine how much longer it must have seemed! Great tips on how to book, pay and when to show up. Pinning this to my Bali board! The Hubs often gets sea sick Annick. He felt a bit queasy on the first run so took sea sickness tablets for the last two. Thankfully he was not one of the ones throwing up. And yes it felt like forever. I don’t scare easily but this was horrific! Check the wether carefully before you book your ticket and make sure the seas are calm! Wow! This is cool. We’re off to Bali in October and would explore the possibility of visiting the nearby islands. Thank you for sharing this. Appreciate your detailed review. We loved both Lembongan and Gili T. Defo worth a visit! I can see that 15 minutes of the last boat trip were horrible for you. It must have been a nightmare. We do see lots of incidents with Bali boats which as you mentioned do not have a very good safety record. Again bad on the part of the Captain to abandon his crew when needed. The good thing is you hit land safely. It was terrifying Sandy. Very glad we made t off safely. We certainly learned it lesson and I will be checking the weather before taking any boat ever again.